Feature self – locking brass key holder to permanently hold original keys. 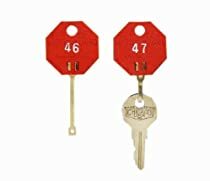 Sturdy, hook – style, plastic key tags are 1.25 in high and feature self – locking brass key holder to permanently hold original keys. Designed to work with the dupli – key system, attach your master keys to red octagonal – shaped, self – locking key tags to make sure they remain on the key hooks and your original is never loaned. Packed 20 per pack. Imprint numbered sequence – 21 – 40. Type self – locking octagonal key tags. Color – red. Dimensions – 1.25H in. Material plastic, brass key holder.